1. Benjamin de Tudela visited Europe, Asia and Africa in the 12th century, writing vivid descriptions everywhere – including his account of western Asia a hundred years before Marco Polo. 2. He was from the Navarrese town of Tudela in what is now Spain, where a street in the former Jewish quarter is named for him. Little is known of his early life, but it is clear that he gained a broad proficiency in languages. 3. 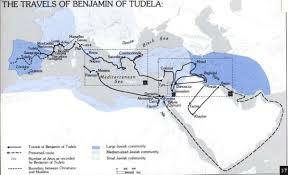 His Travels of Tudela, also known as the Book of Travels, describes the Jewish communities of his day. It is considered a reliable source of information about the geography and ethnography of his time and is consulted for information about daily life. 4. His work, written in Hebrew, was translated into Latin and then other European languages. From the Renaissance to the present, it has been a key primary source for scholars of medieval history. 5. He started his travels sometime between 1159 and 1165 and ended around 1172 or ’73. Starting from the Iberian Peninsula, he went to France, Italy, Greece, Constantinople, Syria, Lebanon, the Land of Israel, northern Mesopotamia, Persia (Iraq and Iran), Arabia, Egypt and Northern Africa. Wherever he visited, he gave the demographic count of Jews, the names of their community leaders, their occupations and the activity of their merchants. Want to know about the intellectual life of Jewish Provence or the organization of synagogues in Egypt? Tudela is your man. 6. In all he visited over 300 cities, describing their landmarks, buildings, marketplaces and the customs of their citizens, both Jewish and gentile. He gives one of the earliest accurate accounts of the ancient site of Nineveh – near modern Mosul. 7. His style was concise and easy. Want to read it for yourself? You can do so online at Project Gutenberg. His work is still available in many languages: it’s a gold mine of information for Jewish and general history. 8. The 19th century writer Mendele Mocher Sforim wrote a kind of Jewish Don Quixote with a title inspired by Benjamin de Tudela – The Travels [or Wanderings] of Benjamin III. 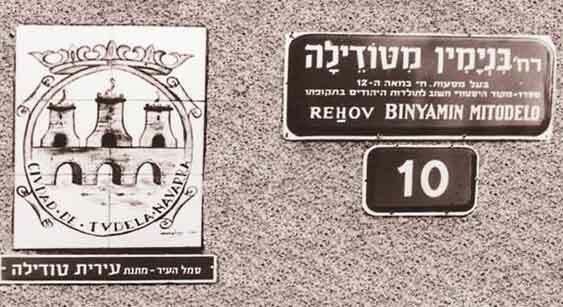 Look for Binyamin miTudela Street in Jerusalem’s Rehavia neighborhood, just south of Magnes Circle. Author’s note: OOPS! My brain was on summer vacation last week – post written, but not properly scheduled. My apologies. 1. David Daniel Marcus was born in New York in 1901 to immigrant parents. He learned boxing for self-protection in the Brooklyn neighborhood where he went to school. 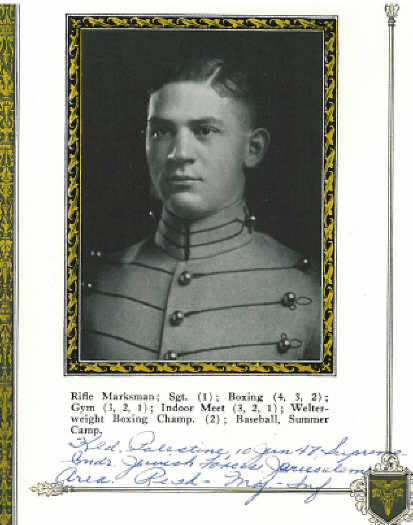 He was admitted to West Point in 1920 and graduated in 1924 with an outstanding record. 2. After active service, Marcus attended law school. In the 1930s he served as federal attorney in New York and helped bring Lucky Luciano to justice. Mayor LaGuardia named him Commissioner of Corrections for New York City. 3. In 1940, he went back into the army. After the attack on Pearl Harbor, he volunteered to fight in the war. He parachuted into Normandy, saw fighting service, and helped draw up the surrender terms for the Axis powers. 4. The year was 1944: Marcus was in charge of planning how to sustain the lives of those in the areas to be liberated. He was responsible for the prisoners in the death camps; he entered the camps, coming face-to-face with the survivors and the dead. 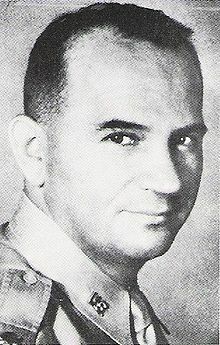 After the war, he was named chief of the War Crimes Division, planning for the Nurenberg trials. These experiences, as might be expected, turned him into a Zionist. 5. While the United Nations deliberated over the establishment of the State of Israel, Marcus was serving as a colonel in the US Army. He was wooed by Yitzhak Shamir to help pull together a ragtag set of citizen-soldiers into a fighting force. In January 1948, “Michael Stone” arrived in Tel Aviv, using the assumed name to satisfy the US authorities and to avoid problems with what remained of the British Mandatory authority. 6. He designed a command structure for the new army, wrote training manuals and identified weak positions. When, in May 1948, the new state was attacked by Arab armies, the new army of Israel was ready. 7. Marcus had prescribed hit-and-run tactics with the Egyptian army, a technique that worked well in the south. As commander of the Jerusalem front, he broke the siege of that city by building a new road – the “Burma Road” – to bring in supplies to the Jewish defenders; the Arab siege was broken just before the cease-fire took effect. Israel’s borders were kept virtually intact. 8. As a commander he inspired confidence in his men. David Ben-Gurion, Israel’s first Prime Minister [see my blogpost of October 9, 2013], named him Lieutenant General, the first general in the army of Israel in nearly two thousand years. 9. He did not live to see the peace. Six hours before the cease-fire, he was killed by friendly fire. 10. 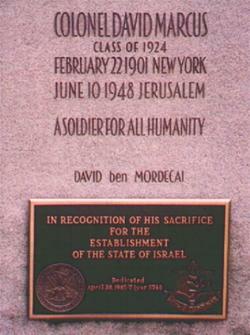 Marcus was buried at West Point with a tombstone reading, “A Soldier for All Humanity.” A monument has been erected to his memory where he fell, now in Kiriat Telshe Stone near Abu Gosh. 11. A biography about him was written in 1962 by Ted Berkman, Cast a Giant Shadow. A movie of the same name came out in 1966. 12. Kibbutz Mishman David and the neighborhood Neve David in Tel Aviv are named for him, as is the Colonel David Marcus Memorial Playground in Brooklyn. In Haifa you’ll find David Marcus Street in French Carmel, just east of Tchernichovsky Street. 1. 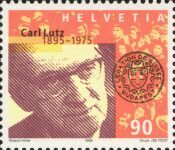 Charles “Carl” Lutz was born in Walzenhausen, Switzerland, in 1895. He studied in the United States and then elected to remain there for more than twenty years, working at the Swiss legation in Washington, DC and in various consular offices. 2. From the mid-thirties until early in the forties, he served in Palestine as Swiss consul. His photo files of those years are housed at Yad Vashem. 3. In January 1942, he arrived in Budapest as the Swiss vice-consul. Because of the war then raging, he also served the interests of the United States, Great Britain and twelve other countries that had cut off ties with Hungary. 4. When the Germans occupied Hungary in March 1944, Lutz tried to stop deportations of Jews to the extermination camps. 5. Working alone and with Raoul Wallenberg (of the Swedish foreign ministry), the Red Cross and others, he issued passports and documents and organized rescue missions, providing safe houses for Jews. Here’s how it worked: Initially he issued four group certificates of aliyah for 1000 persons each – he could issue these because the British held the mandate in Palestine. Soon he “augmented” the certificates, so that each of the thousand persons could bring their families along with them. Almost 50,000 Jews were put out of harm’s way with Swiss letters of protection that safeguarded them until their departure for Palestine. 6. 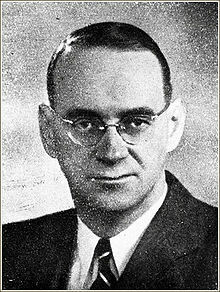 He allowed Zionist youth activists to work out of his office; in October 1944, they forged 100,000 more of these documents – but the plot was discovered, and Lutz was forced by the authorities to identify the false papers. 7. The Germans established a separate ghetto for the document holders. Lutz managed to procure additional buildings to house 3000 more Jews under his protection. Only a handful of them did not survive the war. 8. When, in November of 1944, Eichmann ordered a forced march of Budapest’s Jews to the Austrian border, Lutz – among others – pulled as many Jews as he could out of the shuffling columns and returned them to Budapest. He is said to have jumped into the Danube to save a bleeding Jewish woman, bluffing his way with her past her firing squad and into his car. 9. When the Soviets invaded, he and his wife Gertrud (“Trudi”) fled Budapest and returned to Switzerland. In 1964, he and his wife were named to the Righteous Among the Nations at Yad Vashem. 10. Lutz was nominated three times for the Nobel Peace Prize. He died in Bern in 1975. He is estimated to have saved the lives of 62,000 people. In Haifa, Rehov Charles Lutz runs from the railway station to the northernmost point of the Bat Galim neighborhood.